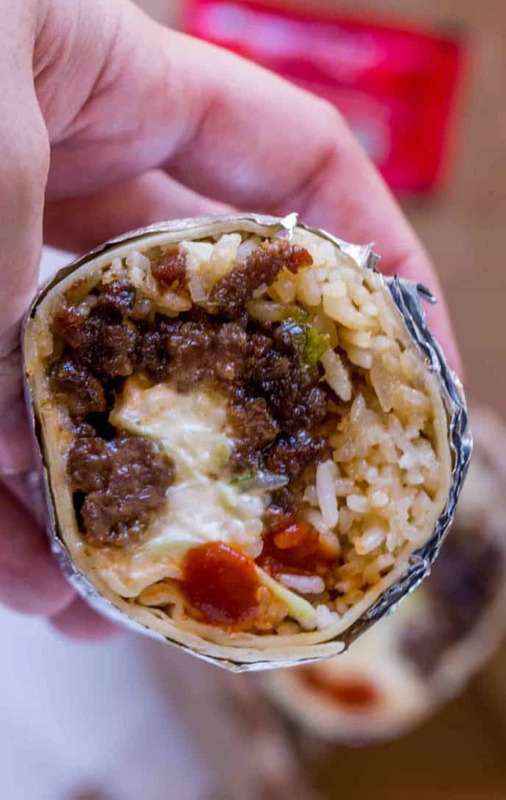 Mongolian Beef Burrito made with ground mongolian beef, seasoned rice, sriracha and a quick Asian mayo slaw. It’s the best burrito you’ve had since Kogi bbq came on the scene. 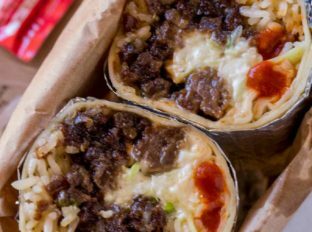 We love this Mongolian Beef Burrito because it’s like sitting down to an entire takeout meal in one with the ingredients of a Mongolian Beef rice bowl in portable fashion. 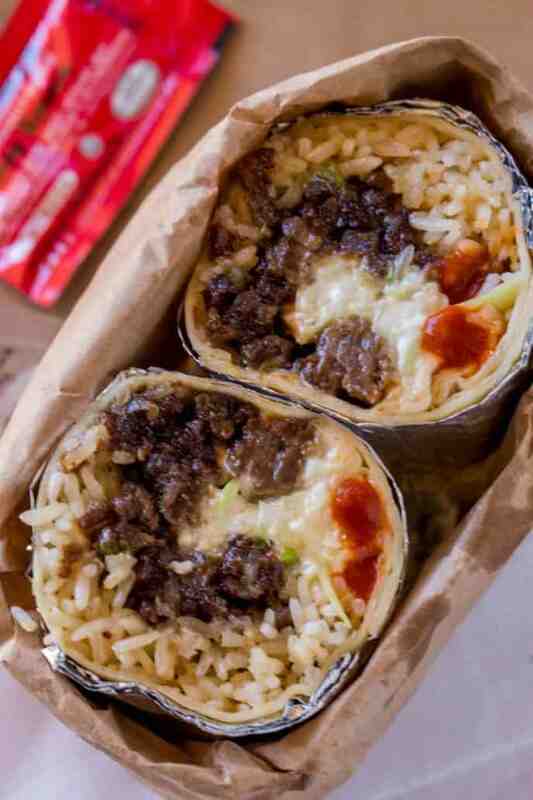 The idea of a Mongolian Beef Burrito came to us one day completely randomly. We made lunch and then got a call that we’d forgotten an appointment that we were almost late too. I grabbed a couple of burrito sized tortillas, tossed our Ground Mongolian Beef into the tortilla with the rest of our bowl ingredients. I wrapped it in foil and threw it in the toaster oven while we were getting ready to run out the door so it would stay warm for us for the rest of the drive. Even though we posted the Orange Chicken Burrito months ago, this version was the reason that one existed! The flavors are AMAZING. By using ground beef instead of steak we cut down on costs, time and it makes eating the burrito even easier! 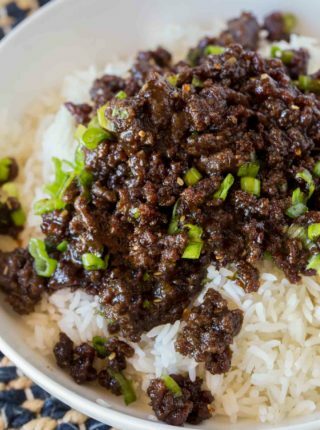 Adding a bit of rice vinegar to the rice is the perfect complement to the sweetness in the Mongolian beef. Topped with the spice of Sriracha and the cool, creamy mayo based slaw this burrito is a well balanced…well…flavor bomb. The final trick is that we put it in the toaster oven before serving. It doesn’t technically need it if you’re rolling them fresh and eating them, but hear me out. When wrapping and toasting the burritos it gives them a bit of time for the flavors to meld, it also helps hold the burrito together. Finally if you have to travel before eating them, I highly recommend the toasting as it keeps them perfectly hot until you arrive. The last time we made these Mongolian Beef Burritos I actually made them for my husband’s basketball league game. With travel and waiting for the game to end they kept warm for over 30 minutes (I use this heating/cooling pack with this car adapter anytime I travel with food) and people commented they were perfectly hot. 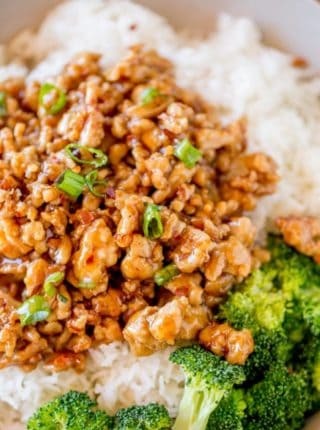 Want more Asian Food Recipes? Mirin: A sweetened Asian wine, if you don’t use this use white wine with a 1/2 teaspoon of sugar. Heating/cooling pack and car adapter: Plugs into a wall or car with the adapter, I use them anytime I travel with food. 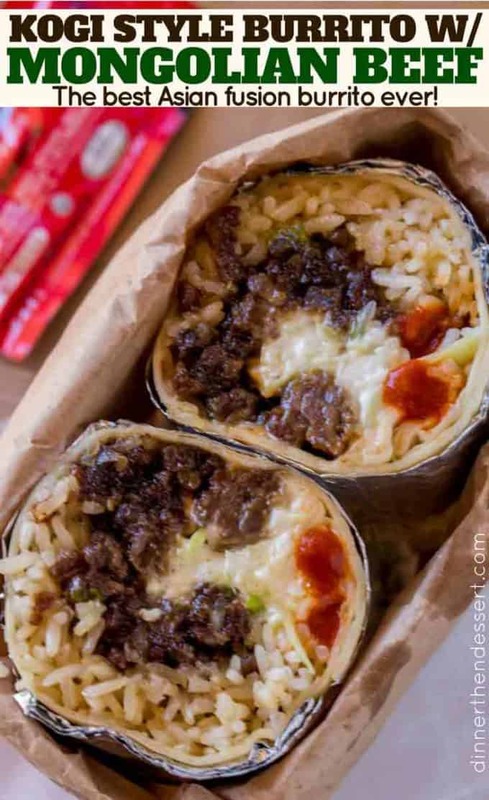 Mongolian Beef Burrito made with ground Mongolian beef, seasoned rice, Sriracha and a quick Asian mayo slaw. 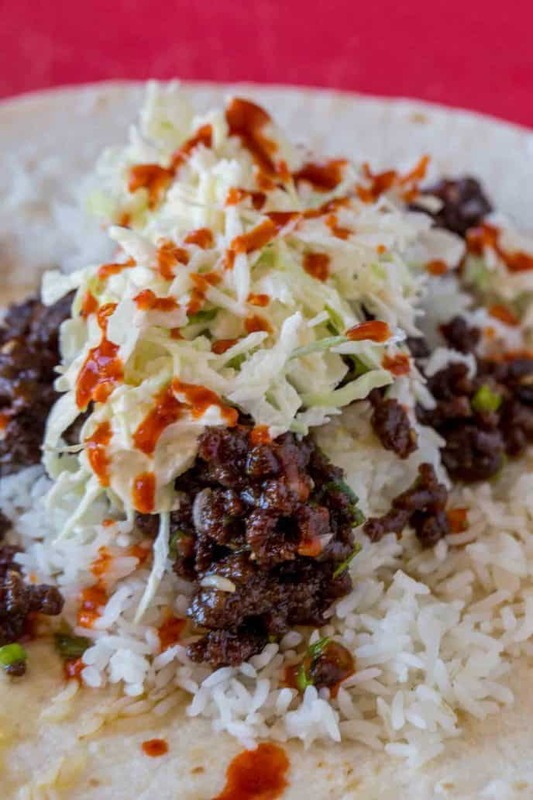 It's the best burrito you've had since Kogi bbq came on the scene. Mix the ingredients together and let sit while you make the beef. 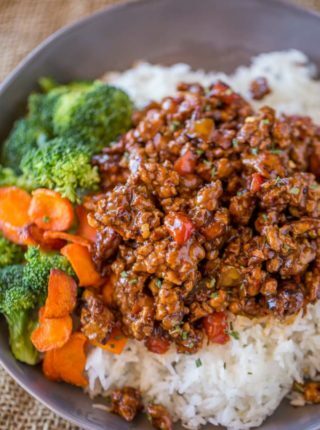 Once the rice is steamed allow to cool for a few minutes, then slowly pour over the vinegar and using a cutting in (not stirring motion) chop it into the rice like you’d be chopping ground beef in a skillet. Let sit while you make the Ground Mongolian beef. Brown the meat really deeply with sesame oil. Once browned, drain most of the fat, then add the garlic and ginger. Add the mirin, rice vinegar, brown sugar, soy sauce, sesame seeds and red pepper flakes. Cook until the liquid has reabsorbed and the meat is shiny but not soupy. Warm your tortillas in the microwave under a damp paper towel for 10 seconds. Use a sheet of foil for each burrito. Lay the tortilla down then add 1/2 cup of the rice mixture. Add in 1/6th the meat and 1/6th the slaw mixture. Roll the burrito tightly then wrap the foil around it. * I toast mine even if I am going to eat them right away - it tastes way better this way. I probably won’t get a reply before I make this tonight but I can’t STAND the taste of seasme oil. Any time I’ve used even a drop of it I can’t stand whatever it is, even the smell makes me sick. Is there ANYTHING I can sub that oil with? I don’t expect a 1 to 1 substitution but at least something that would taste good would be nice or will be it be fine if I omit it all together? You can substitute with any type light of oil (olive, peanut, sunflower, etc) you prefer knowing that it will alter the taste from the recipe. I hope you enjoy it! I’ve made this recipe many times, my family loves it. Since I don’t have a toaster oven, I toast the foil wrapped burritos, topped with a heavy press, in a cast iron skilled. turning over once. It works great. Thanks for the recommendation! So glad you enjoy it! So sorry those bags aren’t available at your grocer. You should fine if you have about 2- 2 1/2 cups of finely shredded cabbage. Enjoy! I made this for dinner last night. Thank you for another great recipe. I wanted to make the slaw but didn’t have any cabbage so I just added some kimchi. Very budget friendly meal without sacrificing any flavor. So glad you enjoyed it, Angela! What a great combo for a burrito! Love this! Oooh, that’s just pure awesomeness right there! That burrito is making my mouth water!! 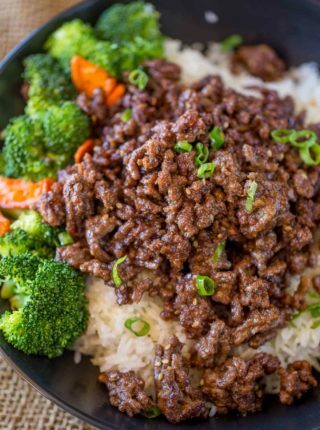 There is so much flavor in the rice, the slaw, and the beef! I’d love to have Mongolian Beef Burritos for dinner! Packed with so much deliciousness!! Definitely need to make these!